Editor's note: Google+ profiles are not yet available for businesses and other organizations, as this story originally suggested. Google+ has finally opened for use by Google Apps for Business users, presumably in an effort to roll out any kinks before throwing the doors open to the world. Being first at bat can have intangible benefits on the Internet, including a valuable backlink to your company website from your professional Google+ profile. Here's how to join this limited group of users and make the most of your Google+ profile before everyone else. First, you'll need Google Apps for Business--which is definitely useful, but we're just using it to get to your Google+ professional profile for now. If your business already has that established, contact your IT administrator about adding Google+ to your account. (You can share this article for reference.) Note that these following steps are for account administrators. 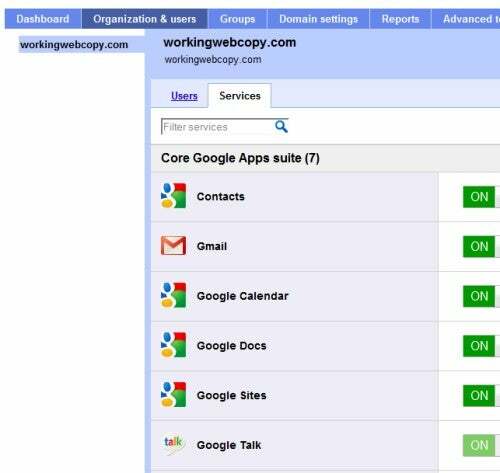 If you don't have Google Apps for Business, the price of entry--in addition to $5/month per user--is a website on your own domain, which we'll assume you have. Go to this page to get started. Remember to choose a strong password unlike your others, since this is for business. If you're already signed in to another Google account, you'll be asked to sign in with your new Google Apps account. Do it. Get started with the Google Apps Dashboard. 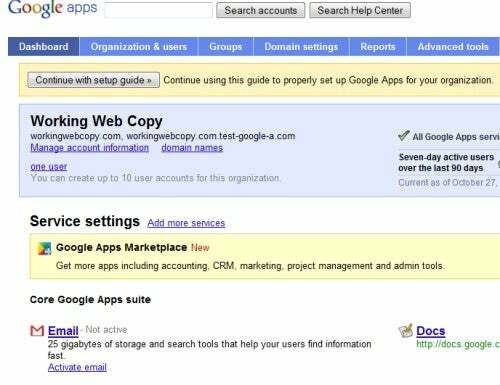 You'll be taken to your Google Apps Dashboard, which gives an Express or Custom setup option. If you're an IT manager for a larger corporation, this is where we part ways as you run off to Custom land, where you do all the stuff I don't need to tell you how to do. For the rest of you non-technical types, click Express, then Next. A process will ask you to verify ownership of your domain. If you don't manage your own website, you'll have to send the file off to your design house to be uploaded into the root of your Web directory. Copy and paste the information you're given on the verification screen to send to them, and download the required file. Click Verify once the file is uploaded, and you're off to the races. Uncheck Gmail on this screen since it's a pain to set up if your hosting provider isn't on the drop down list. Keep Docs and Calendar checked and keep on clicking Next. On the billing screen, click Do This Later unless you really want to give Google money immediately. Choose your mobile devices on the next screen (note Google's "Our Favorite!" next to Android). After this point, keep on clicking Do This Later unless you want to explore the options available to you. You're officially done setting up Google Apps, and now can get to the good stuff. Click on the Organization & users tab on your Google Apps Dashboard. Right now, you can only enable Google+ for specific users. Click the users you want to add the services for, then click the Services tab. Before enabling Google+, you'll need to enable Google Talk and Picasa Web Albums under that services tab. Both are automatically set to be on. Next, scroll down to Google+ (Pro tip: It will be one of the only services not enabled automatically) and set it to On. Save your changes at the bottom of the page, and you have a shiny new Google+ profile for your business. Go to your Google Calendar or Google Docs page, as long as you've already enabled them in Google Apps. If you're still signed in under your Google Apps for Business user name, you'll see your Google+ profile in the upper right. Click on the spot where a photo should be and hit Create Profile. As we've already suggested, creating a separate profile for business use is preferable if you're in a larger company, since IT admins and others will have access to your Google+ stream. However, if you are a micro-business and already active in Google+ circles, Google is working on a migration tool for you to port your current profile on over to your Google Apps profile. When creating your profile, keep in mind that you're creating a business profile. The "Bragging Rights" section probably shouldn't include being able to drink 20 shots of Jager and walk home. I've already devoted a story to creating a great Google+ profile, so check it out. Probably better to leave this to your personal profile. Once you're done with your profile, return to your Calendar or Docs. Click next on your profile picture at the top right, and click on Google+. You should be invited to join Google+ again (or not; it's in beta mode, so anything could happen) and click on some people you want to follow. If you go to your home screen, you're given the option in the right sidebar of inviting people by email. You're not given a unique URL yet that you can share on your business cards and email signatures, but hopefully that's coming soon. After puttering around on Google+ for a while now, I can see why it could end up being the business social network of choice. If you have a business-only account, you'll be interacting with people from your industry and clients rather than trying to shut your chat availability to "off" to avoid your great-aunt's repeated questions about your family plans. It's not a replacement for Facebook, but it could knock LinkedIn off its perch as the predominant social network for business. Angela West dreams of opening a Fallout-themed pub featuring wait staff with Pip-Boys. She's written for big insurance companies, small wildlife control businesses, gourmet food chains, and more. Follow her on Twitter at @angelawest, on Google+, and on Facebook.